Most of the activities that make up day-to-day Active Directory management either are repetitive or obey a strict and easy to define set of rules. If a task falls into this category, it means that it can be automated, which is one of the core ideas of Adaxes. It allows you to streamline all sorts of administration and management routines in AD, Exchange and Office 365, taking them out of the way and freeing time for something more productive. To automate a certain management scenario with Adaxes, all you need to do is define a set of actions that needs to be executed before or after specific events in Active Directory. For example, you can configure Adaxes to automatically perform certain operations when a new user is created in AD, when an existing user account is updated, when a new member is added to a specific group, when a user is terminated, etc. You can also use If-Else conditions within workflows, which enables automating scenarios that need to follow some complex business logic. For example, Adaxes can run different sets of actions depending on the user's job role or department, which groups is the user a member of, who is initiating the operation and other parameters. Out of the box Adaxes provides a variety of actions that can be used in automated workflows, but it doesn't mean that you are in any way limited by them. You can easily extend the built-in functionality by seamlessly integrating your own PowerShell scripts into the workflows, so they'll be treated just like any other action and executed automatically when it's required. With Adaxes you also have the ability to granularly control, where in AD each of your automated scenarios needs to operate. This can be useful if, for example, you need to apply different automation rules to different offices or if you are managing several organizations, each with its own business logic. Adaxes also features Scheduled Tasks, which can be used to automate any repetitive administrative activities in AD, Exchange and Office 365. You can use the same condition-based approach to set up the workflows and then run them on a periodic basis with no human interaction required whatsoever. To top it all up, Adaxes allows you to add approval steps at any point of any workflow. This enables you to safely automate even the most sensitive activities, as you are still in charge of the situation and never lose any control. The approach to automation that Adaxes provides, allows tackling practically any management scenario that you might have in your environment. Here are some of the most common ones that you can start with. With Adaxes you can fully automate all the onboarding procedures that need to be executed once a new user comes in to your organization. This way you can make sure that all users will always have their accounts set up timely, according to their requirements and without spending a ton of IT staff's effort on it, as Adaxes does all the heavy lifting. Same approach can be applied to offboarding the users who are leaving, which is effectively provisioning in reverse. By automating the termination process, you can make sure that all accounts are properly disabled and all access rights are revoked instantly, thus eliminating any security risks associated with ex-employees. Another very common routine that can be easily automated is group membership management. You can configure Adaxes to automatically add and remove users from groups based on the rules that you have in your environment. For example, once a new user is created, Adaxes can add the account to the groups that correspond the user's department. If someone then switches, e.g. from Accounting to Sales, Adaxes can automatically remove the user from the groups associated with the old department and add to all the groups corresponding to the new one. 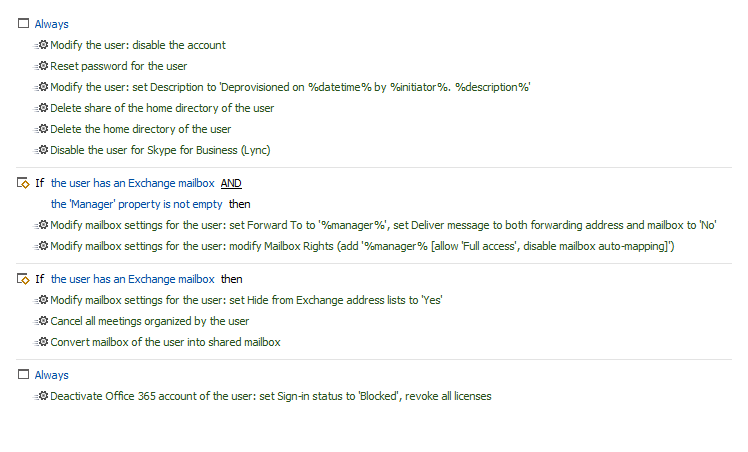 Using Adaxes you can also ensure that the location of objects in Active Directory corresponds to your policies. For example, if you have a geo-based environment, you can automatically move users to the OUs associated with their office and make sure that they stay where they should be. In addition to various Active Directory management activities, Adaxes also allows automating tasks in Exchange and Office 365. For example, it can automatically create a mailbox for a new user either in on-prem Exchange or in Office 365 and configure it according to the user's specific needs. Same approach can also be used for any other updates during the user lifecycle. You can also automatically assign and revoke Office 365 licenses with the help of Adaxes. This way you can make sure that at any point of time everyone has got only the licenses that they need and that there are no unused ones hanging around. For example, when a user switches to another position, Adaxes can revoke all the licenses that the user no longer needs and assign all the missing ones associated with the new role. There are myriads of other scenarios that Adaxes can help automating. For example, importing new user accounts to AD from CSV files, which can be generated by your HR system. Any user account updates, like promotions, sending users on vacations and sick leaves, assigning them to projects, etc. Cleanup activities, like removing inactive user and computer accounts, empty groups and stale OUs. Sending notifications on things like soon-to-expire passwords or accounts. You name it, the sky's the limit here. By incorporating automation into your everyday management activities, you can save a huge chunk of time that members of your staff would otherwise spend on executing them manually. In addition to the savings of resources, automation also adds the benefits of standardizing all the procedures, eliminating the human factor and thus reducing the number of mistakes, ensuring compliance and integrity of Active Directory. Because so many business processes rely on AD, all that translates to improved security and a boost in the overall efficiency of your organization.